Countless studies have proven that e-Learning is an economical, effective way to provide training on most subjects. Rivertown Communications can design course modules to achieve your goals, produce the needed audio, video, animation and graphics to enhance the content, program the modules, and provide a hosted Learning Management System. We’ve created modules as short as 5 minutes and systems as long as 40 hours, on a multitude of subjects. Our e-Learning is self-paced, interactive and effective. We are experts in creating training that meets all accessibility standards and in localized, multilingual courses. Call us to discuss your course! Instructional Design is the practice of combining content from a variety of sources into a training course that maximizes the effectiveness, retention and appeal of your content so that it helps improve the performance of your audience. An effective instructional design distills the training goals of your organization with the experience, time available, and educational levels of your audience to create an effective training course that maintains learner interest while meeting your desired educational result. Our instructional design will include all necessary content and provide the learner with interactions to practice and demonstrate newly acquired knowledge. Quizzes will be included so that the learner can judge their understanding of the topics and your training managers will be able to assess learner progress. Analyze - analyze learner characteristics, task to be learned, your needs etc. 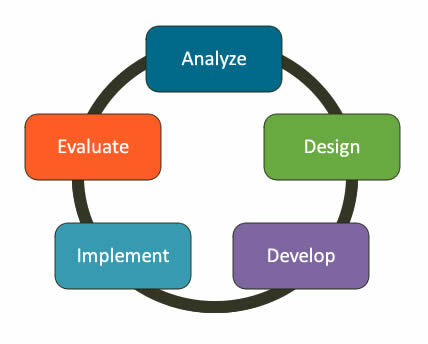 A successful training course always begins with the quality instructional design. Our designers will work closely with your experts and content to make sure all your training objectives are met. Your team will have input design and development all along the way. After the instructional design is completed, the next stage of development is to create a clean, professional computer interface that is both attractive and intuitive to use. Our graphic designers combine an understanding of system usability, standards for accessibility, and current navigational standards into an interface that enhances your training content and is easy to navigate. As each of our interfaces are designed specifically for you, we can blend your organization’s branding into your e-Learning interface. But graphic design doesn't stop here. Once the interface and program template are designed, our graphic designers will view the content to be delivered and come up with designs for each page. These designs will specify the fonts to be used for title and body text, custom illustrations, photos, animations, and video clips. They will also specify the design and operation of the interactive exercises and learner scenarios that are included. Effective page design will reflect multiple factors, including obtaining the correct text versus white space balance on a page, creating illustrations that are clear and enhance the content, and providing proper emphasis on page elements. Rivertown Communications specializes in developing e-Learning, video and websites that are accessible to everyone, including users with visual or hearing disabilities. For many projects developing accessible applications is a requirement under federal and state law. We believe that developing accessible applications is always a good idea and usually improves usability for everyone. Rivertown Communications is active in promoting accessible communications on a state and federal level. We have a Minnesota Access-IT Master Contract which makes contracting with us easy for public agencies in Minnesota. 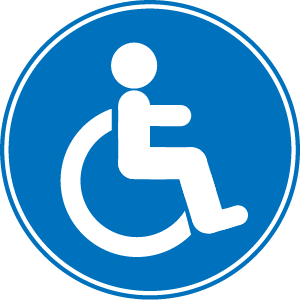 For more information on Rivertown's commitment to accessibility visit Rivertown & Accessibility. Do your training materials grab and hold the attention of your learners? Using video in a training course can do just that, and thereby enhance its effectiveness. Rivertown Communications has professional audio and video production capabilities to meet your business needs. Our 100% digital equipment is fully portable so we can capture broadcast-quality high definition (HD) video and audio anywhere in the world. 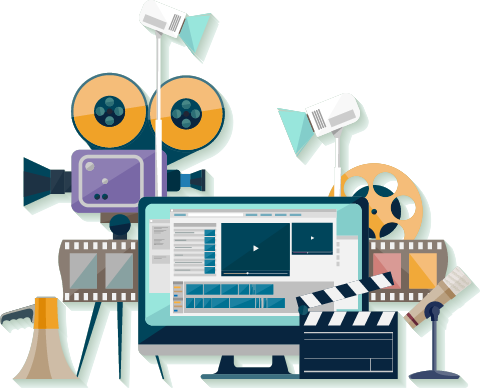 Rivertown Communications can produce a complete video production for distribution over the web or via flash drives or produce short video segments to enhance e-Learning programs or websites. We have the professional equipment needed for a high-quality production including tele-prompter and chroma-key technology, portable lighting and backdrop kits and full digital HD video and audio recording equipment. Our staff has the experience necessary to create an effective, memorable video at your location or ours.